Source: Digital galley courtesy of Disney-Hyperion via NetGalley. Thank you! Ten years ago, God gave Braden a sign, a promise that his family wouldn’t fall apart the way he feared.But Braden got it wrong: his older brother, Trey, has been estranged from the family for almost as long, and his father, Mart, the only parent Braden has ever known, has been accused of murder. The fate of Mart, a well-known Christian radio host whose arrest has sparked national media attention, lies in Braden’s hands; he is the key witness in his father’s upcoming trial. I feel like should be sitting at a desk, strumming my fingers together, murmuring ‘interesting, very interesting’. Why, you may be asking? Primarily because Conviction took me by surprise- in a good and unanticipated way. It is an intense YA novel that asks some unanswerable questions, offers multiple turns and revelations, presents layered characters, and holds one heck of an emotional plot. All in all, for a debut YA novel, Conviction is very well done. There were just a few issues I had that took away from my overall experience with the novel. The first and primary point of issue is that it took me multiple chapters to get into the book. This is not a criticism of Gilbert’s writing per se or the story, but it felt like it took a significant length of time for the narrator’s voice (and thus the story) to find its groove and get to- for lack of a better word- the meat and potatoes. For the first number of chapters I was wondering: where is this story going and what is the primary focus? Is it predominantly about belief in Christianity and/or a crisis of faith? The trial of Braden’s father and morality? A potential romance for Braden? Analogies between life and the game of baseball? The complexities and tragedies of father and son relationships? Familial love and loyalty? Well, as a reader, we find out that it’s about all of those things in equal amounts- it just takes a good bit of time to come together. But when it does, hang on, because it does so in a focused and well thought-out narrative. As noted above, there is a significant amount of baseball talk and action here, and as someone who knows next to nothing about the sport, I have to say that it did not detract from my overall reading experience. I was, however, (unsurprisingly) most taken with the parts of Braden’s narrative that were about: the incidents leading up to the night of alleged murder; the trial; the interactions between Trey and Braden; and, last but not least, Mart’s back story of how he raised the two boys on his own.The chapters that deal with Trey and offer glimpses into his childhood with Mart and what ultimately led to his leaving Braden and Mart are particularly bleak and upsetting- but, my goodness, just beautifully written, so compelling. All of these aforementioned plot lines are sharply written, focused, and pack some emotional heartbreak. 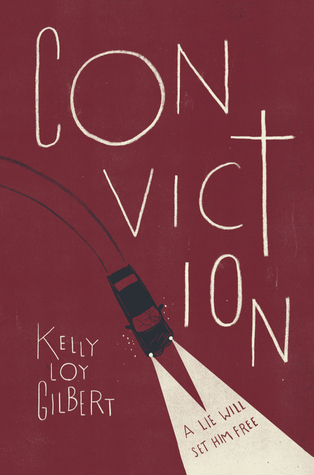 Overall, Conviction is a strong contemporary YA debut that does not shy away from contentious questions and subject matters. This novel will likely appeal to readers who enjoy contemporary and emotionally-charged, issue driven novels. Fans of Lara Zielin, Anna Jarzab, Robin Brande, Mariah Fredericks, Sara Zarr, or Holly Goldberg Sloan might be especially drawn to Gilbert’s debut novel. I received this book as a digital galley from Disney-Hyperion via NetGalley in exchange for an honest review.